By the time students leave St. John's in 8th Grade, they are academically prepared for the next level. Many graduating students test into advanced courses in High School. All students in grades 2-8 in the Archdiocese of Denver Catholic Schools take the Iowa Assessments each February. The Archdiocese has used this standardized assessment program for many years. It is a nationally recognized exam that serves as a standard to assist Catholic schools in assessing the delivery and mastery of the curriculum. Iowa tests are considered one of a number of assessment tools to measure student learning and achievement. The charts below illustrate the excellent performance of our students throughout all levels of our school. The above charts show the 2016 test results of the language arts and mathematics portions of the Iowa Assessments at St. John the Evangelist Catholic School. Each chart shows the average grade equivalent score for the grade level tested. For example, in the first chart below, the 8th grade average grade equivalent (GE) score on the language arts test was 13.0. To be considered "on grade level," the score would be expected to be 8.5 (5 months into the 8th grade year). The score of 13.0 shows that the students in the 2016 8th grade class scored significantly better than expected on the language arts tests. It is important to note that the 13.0 GE does not indicate that the students have mastered post-secondary content, but rather that they performed in a way on the 8th grade test that we would expect a much older student to perform. 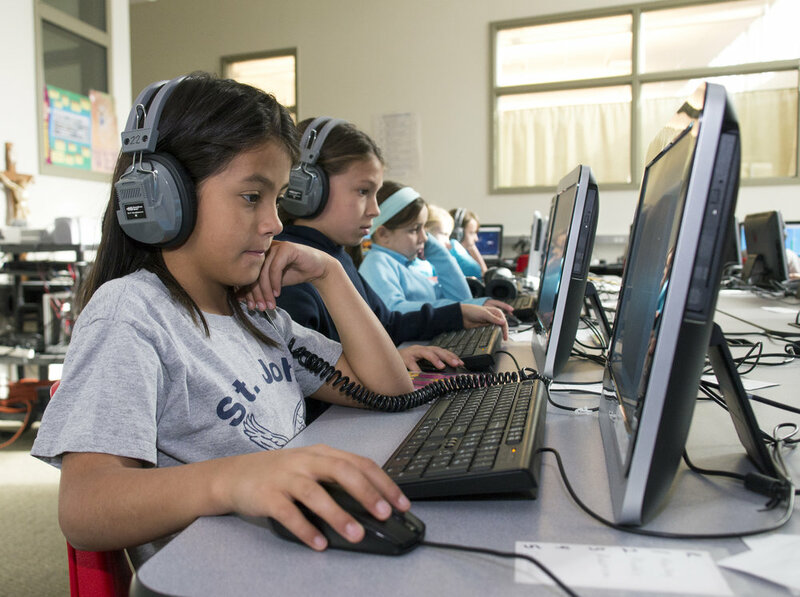 In addition to the Iowa Assessments, St. John the Evangelist Catholic School utilizes other forms of testing to help measure student achievement - Accelerated Reader and STAR Assessments. Students begin with these programs in Kindergarten. The results are individually based and help teachers personalize your child's instruction. AR is a computer program that helps teachers and librarians manage and monitor children’s reading success. A student chooses a book at his or her own level and then takes a short computer quiz that covers the content of the book. If the student passes the quiz, it means they understood the material. The feedback from the quiz helps parents, teachers, and librarians monitor a student's reading progress and also aids in setting goals and helping the student advance his or her reading skills. Star Assessments are short reading and math tests that are given 3 times per year. They provide teachers with learning data. Star tests are computer adaptive, which means they adjust to each answer your child provides. Teachers analyze the data they get from Star Assessments to learn what students already know and what they are ready to learn next, to monitor student growth, and to determine which students may need additional help. St. John's does NOT teach to the test. Instead, we follow a proven Catholic curriculum that leads to academic excellence. Our curriculum is approved by the Archdiocese of Denver and builds on the centuries of success in Catholic Education.